Download Printable PDF Calendar Templates in A4, A3 or A2 Sizes. Brandow Mats are a great way to display a calendar on your desk top. 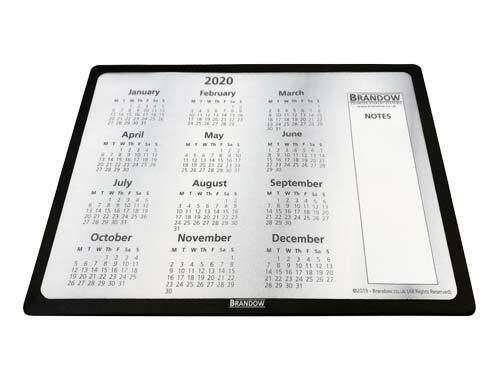 You can print out a monthly or annual calendar and display it in your Brandow Mats, which can be used as a mouse mat. Download and print off some of our useful free generic monthly PDF calendars below to insert into your A4, A3 or A2-sized Brandow mats (no purchase of a Brandow Mat is required) or create and display your own - it's up to you. PDF files may require a viewer such as Adobe Acrobat Reader to open and print outwith your browser. If our generic monthly PDF calendars aren't quite what you're looking for you can also generate your own. Sites such as TimeandDate.com allow you to build and download your own printable PDF calendar.